…but I like the guy. Some see his post-game over enthusiasm as cocky and pretentious, while others think he’s just an emotive kind of guy who loves his fans. Maybe it’s a little of both, but all I know is I like the photo moments he gives up. Who cares if he hams it up, the man knows how to give it up for the camera. 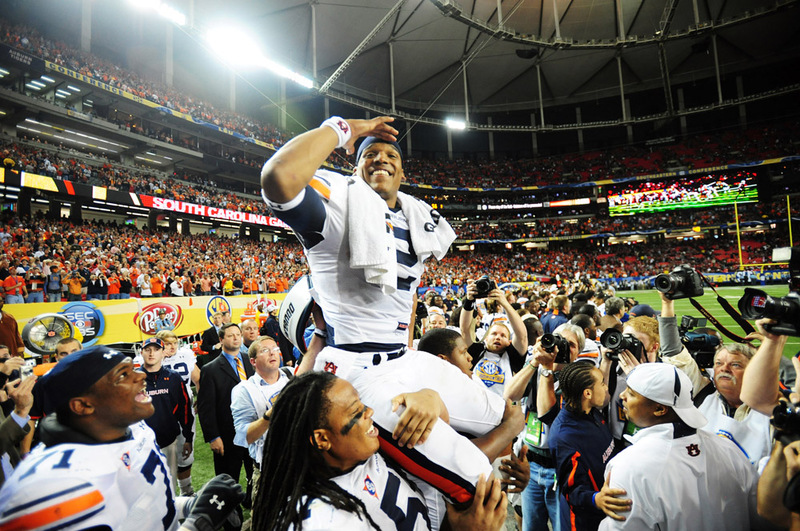 He’s expressive and smiling, and he does things that make our jobs easier – like run around the stadium high-fiving fans or spinning a towel around to acknowledge the crowd, on in the case of the SEC championship game, get carried off the field by his teammates like a scene from a movie. 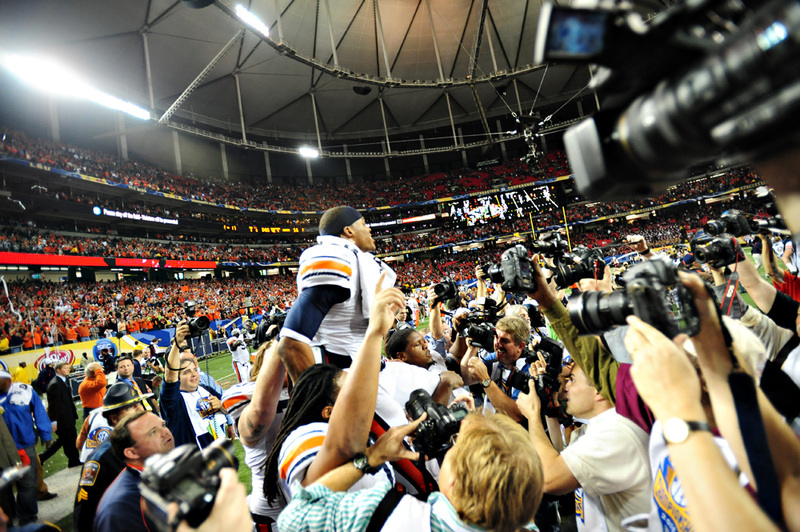 These are all things photojournalists WISH would happen at every game, but they rarely do. But then again, if they happened so often, they wouldn’t be so special and photographable (is that a word?). So therein lies our quandary. I don’t know what it looked like on TV, but that’s one helluva scrum we were in. I’ve never seen anything that pushy and I’ve covered my fair share of big games and star drivers that attract hoards of photographers and television cameramen. I’m always surprised there’s not a photographer who gets trampled or loses an eye in these things. The attitude you have to adopt is one of ‘go all in or don’t go at all.’ Total cluster.